There will be a drink special where the proceed go towards CFF. There’ll be a basketball hoop / arcade machine and the people who throw a certain amount of points within a time frame will have a round on Red Bull‘s tab! The day begins at 9:00am with a Run Club and continues with a 10:00am-1:00pm Lombardi‘s rooftop fitness day including some amazing classes including Yoga, Bootcamp and Kick Abs with live DJ sets. There’s also going to be a raffle with lots of gear & service prizes to be won! It’s Maria‘s Bday fundraiser and Rock the Steps’ Fit-Fair after party. Think music, video, cupcakes, cocktails, props, prizes & more! The Conquistador Climbers will climb 40 flights of stairs to the top of One Sansome Skyscraper in downtown San Francisco. Our team goal is to raise $10,000 for CFF. Please help by donating now. This entry was tagged climbforlife, crunch, crunchfitness, cysticfibrosis, fitness, jbodyworks, lombardisports, lululemon, redbull, rockthesteps, sanfrancisco, skimble, yogaworks. Bookmark the permalink. 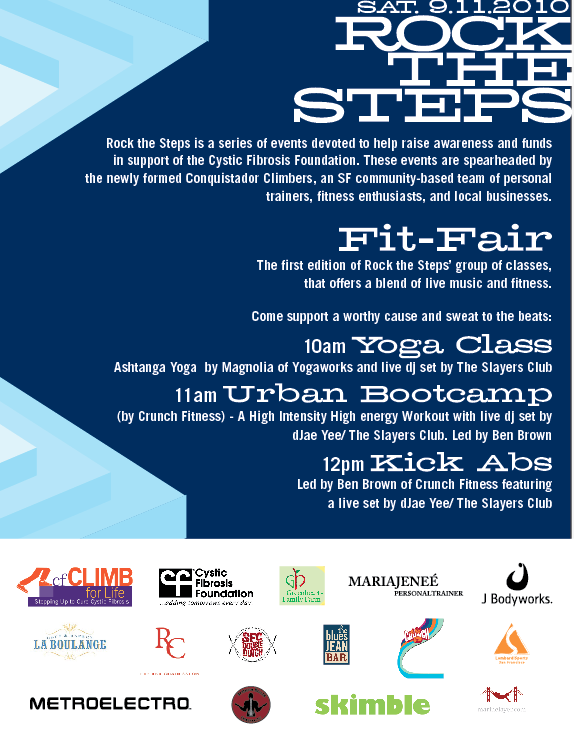 Thanks for posting the Rock the Steps event! Stay tuned for next years’ Climb for Life 2011 and look for exciting events, such as Rock the Steps, surrounding this unique fundraising opportunity!